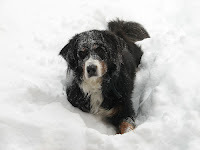 Orca, my Berner, is 11½ years old. She loves the snow as much as ever. In the winter, we call her "Orca Icebiter"